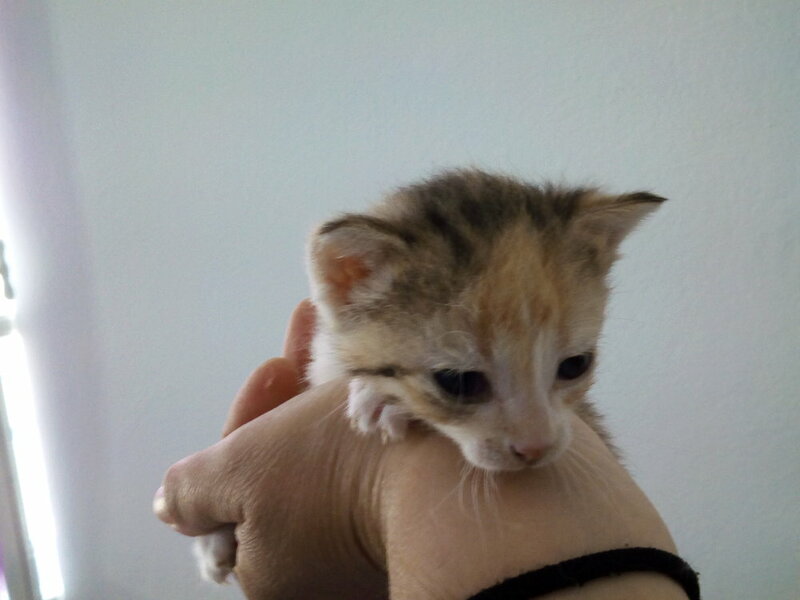 A tiny kitten in great distress was rescued by Anna, our Volunteer in Chora, and brought to us at the Center in January. 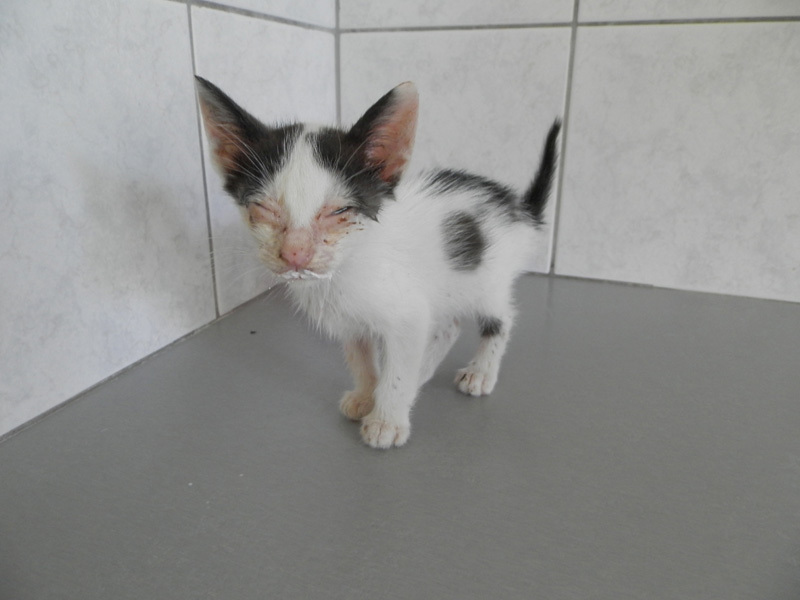 Michos was frail and thin and suffered from many of the problems that cats born on the street are prone to, so many in fact, that we were not sure that we could save him. 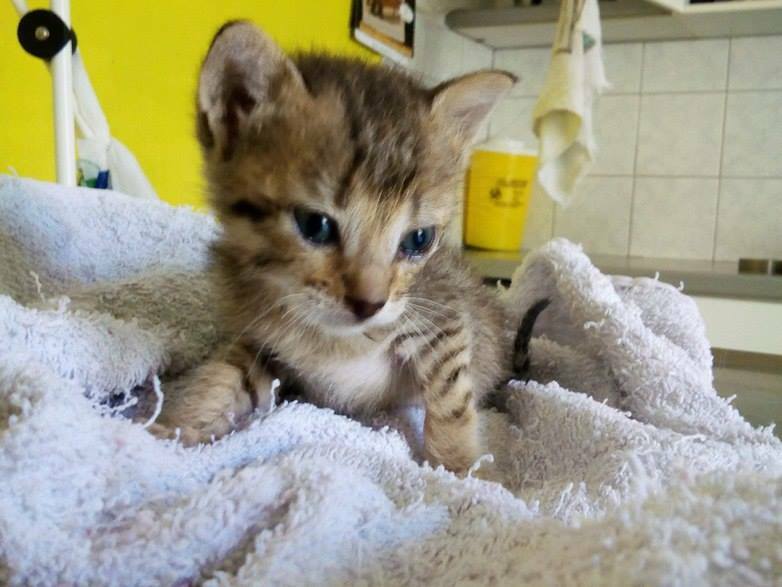 But Michos, this small miraculous fellow, not only survived but thrived and he has now fully recovered and is ready for adoption. 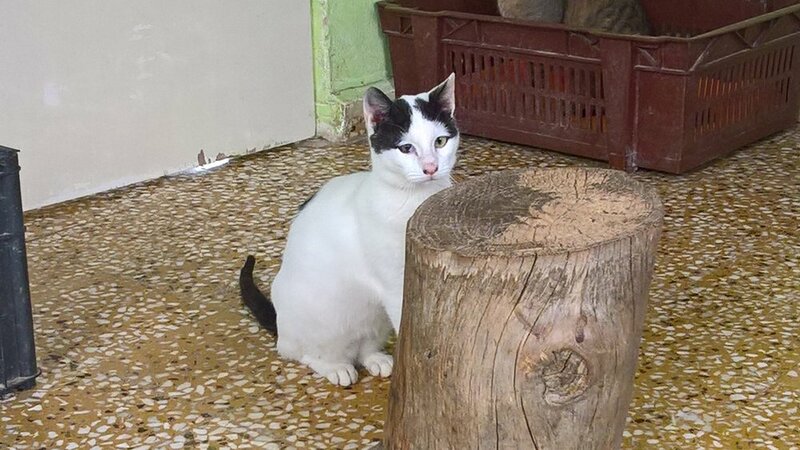 In March we will neuter Michos and we hope and pray that he will be adopted so that we do not have to return him to the place where he was found. He is a sweet, sweet boy and clearly has great strength since he managed to come through a storm of neglect. Now, we hope that his sweetness and strength will find a loving home. Please contact us if you are interested in welcoming into your family! Mao, a blind cat who lived for years in Chora of Amorgos, was rescued by the owners of the Jasmine café-bar and by a young girl named Venia. A few days ago, Venia found Mao lying in the street in agony after having been poisoned. Venia, with her two friends Christos and Despina, rushed to call us and ask for our help. Mao was brought immediately to our clinic where extraordinary measures were taken and today, sweet Mao is purring again and asks for affection. This sweet and innocent creature was saved because someone cared, because three friends acted with kindness and generosity. We give our thanks to Venia, Christos and Despina, and we feel blessed to have been a part of this beautiful moment. Venia will be back in her neighborhood, cared for by the owners of the Jasmine Café and by all those who have been touched by her story. 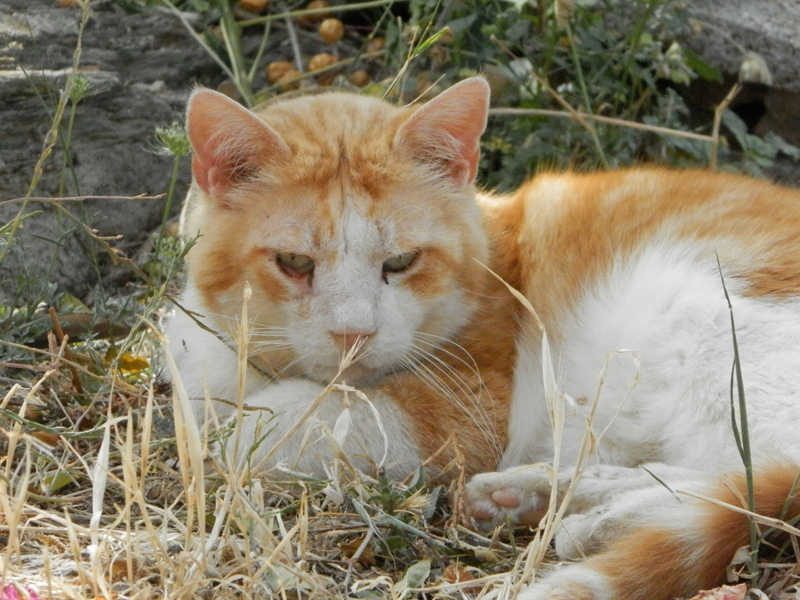 When Koutco arrived in our Center this summer he was FIV positive and had already lost the vision in one of his eyes. Since the other eye was severely compromised, Koutco was struggling to survive on the streets but after an accident that left his front right leg paralyzed his future appeared bleak. Lamia, the benevolent woman who took care of the colony in which Koutco was living decided to contact a friend in Holland and together, Lamia and Juliette, found a shelter for him in Belgium. This is a wonderful shelter and we have sent another cat from Amorgos, the handsome Plume, to find a home with them. The people of Vzw Zwerfkat in Belgium do tremendous work with cats in severe need and we salute them and hope that you will visit their website https://www.zwerfkat.com. They have given Koutco a second chance in life and, now, he is looking forward to his true and loving forever home. The morning and a parked car were hiding a pleasant surprise. We received telephone call saying that a kitten was hiding beneath a car and the owner of the car was unable to tempt the crying kitten out. 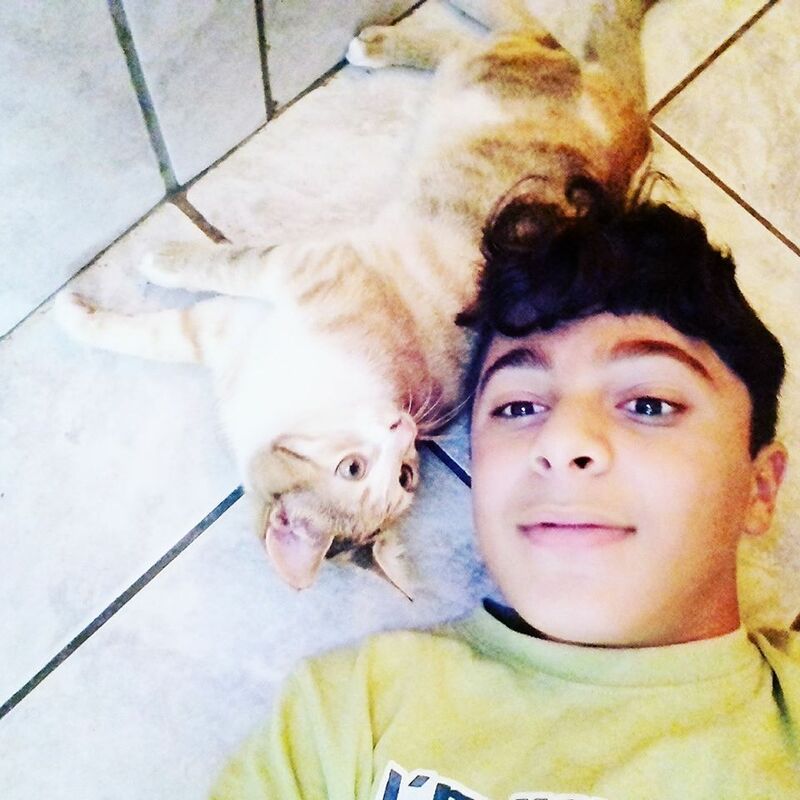 Once Litsa our coordinator arrived, with her knowledge of the language of cats, she began to meow and a baby boy came running out. 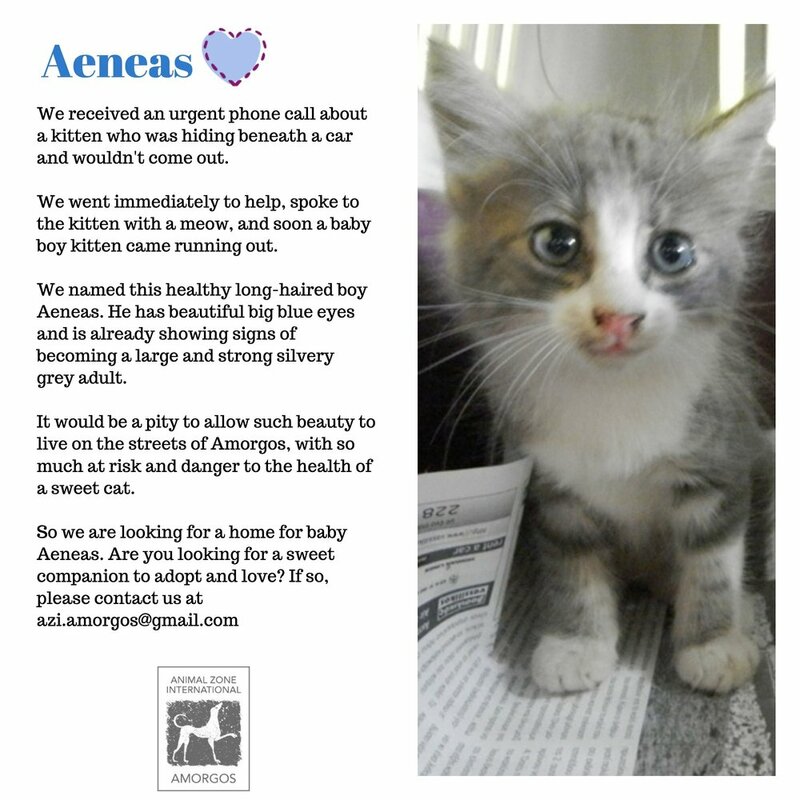 Aeneas is a healthy long-haired boy with beautiful big blue eyes and he already shows signs of growing into a large and strong silvery grey adult. Update (10-18): Handsome Aeneas has found a forever home! He is living with a loving family in Athens. The daughter fell in love with him during a visit and the family couldn’t resist. We know them well and are so delighted that Aeneas will be with a caring family for the rest of his life. Updated photos are below. It is not always easy to tell the stories of our rescues. On the island of Aegiali there was initially a resistance to our sterilization program but we have carried on to great success. Unfortunately there are still cats who give birth to unwanted kittens and a few days ago three small babies were abandoned in a garbage bin. By grace and good luck they were rescued by a kind man who heard their cries and brought them to our Center. Two small girls and one small boy are now safe and healthy and living in a foster home. When they are strong and old enough to eat by themselves they will be available for adoption. Their little lives have now been saved and we wish for each one of them a safe and loving home. Several days ago, we were contacted by two tourists who were swimming in the remote beach of Campi and who had discovered a seagull with a broken wing. Because they were not able to capture the frightened bird, we called Alkoni, the Aegean Wildlife Hospital in Paros and asked for their advice. Unfortunately, by that time, the bird had disappeared from the beach of Campi. Days later the bird was finally captured by two men swimming at the Agia Anna beach. We were able to send the bird to Alkioni in Paros but unfortunately the news is not good. Miguel, as we now call him, must remain at the hospital along with fifty-two seagulls that also are unable to fly. If Miguel is able to come back to Amorgos, one of our restaurants that is close to the sea must agree to feed this broken-winged bird and keep him close to the water that he loves so much. Our appeal is that someone will adopt Miguel and even, perhaps, a few more of the birds who live at the Aegean Wildlife Hospital. It is great work that they do and they need help in this beautiful project that brings wounded and disabled birds back into their natural habitat. Rebeca was found alone on the streets of Chora by a very kind child. He saw Rebeca sitting in a corner unable to move because her both eyes were completely shut, struck by severe infection. He immediately pick her up and brought her to our Center. After 1 week of treatment Rebeca is completely healthy and she plays non stop. Her little friend visited our Center in order to see her and he was very happy to see her fully healed. 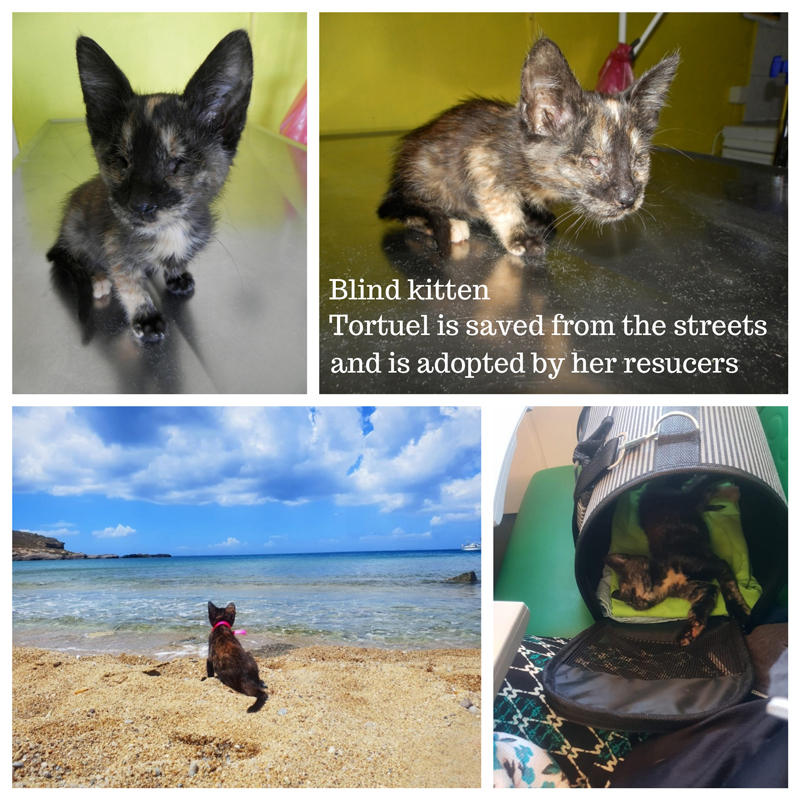 Some weeks ago, a young French couple vacationing in Amorgos came across a tiny blind kitten on the streets of Tholaria. 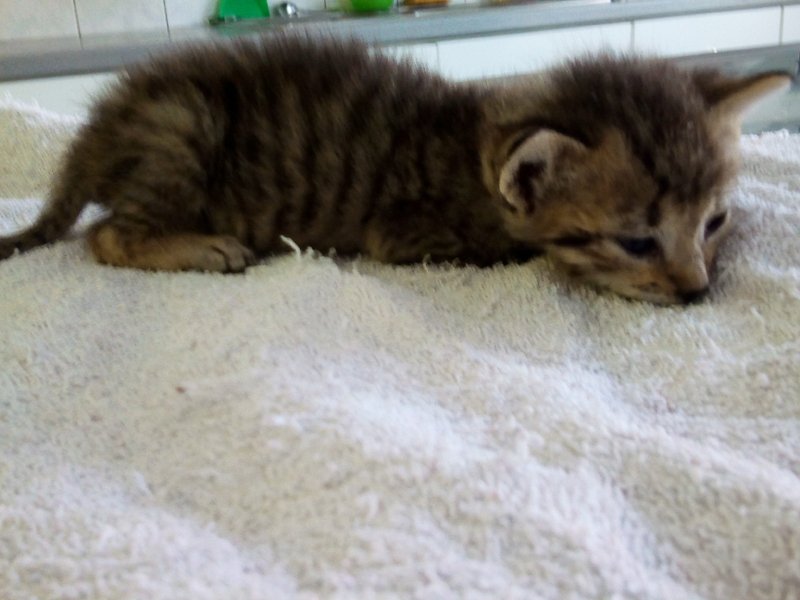 They brought the kitten to our Center in Katapola and visited the kitten during the last two days of their stay. Saying goodby to this small being that they had rescued was difficult and they decided to adopt her and bring her to their home in Paris once she had recovered from her difficult time living alone on the streets. This magnificent couple has traveled from Paris to Mykonos and now to Naxos where they received tiny Tortuel from our veterinarian. She is now living happily in Paris with her loving and wonderful new family. We are profoundly grateful for the kindness and generosity of those who help us in our ongoing work to make the animal kingdom of these islands a safe and healthy one. During a trip to Syros, on an afternoon walk in beautiful Ermoupoli (the capital of Cyclades) we came across three abandoned kittens. Two of them appeared very sick but the third was in better condition. Desperate and not knowing what to do, we called our vet Manolis Vorisis who lives and works in Syros. 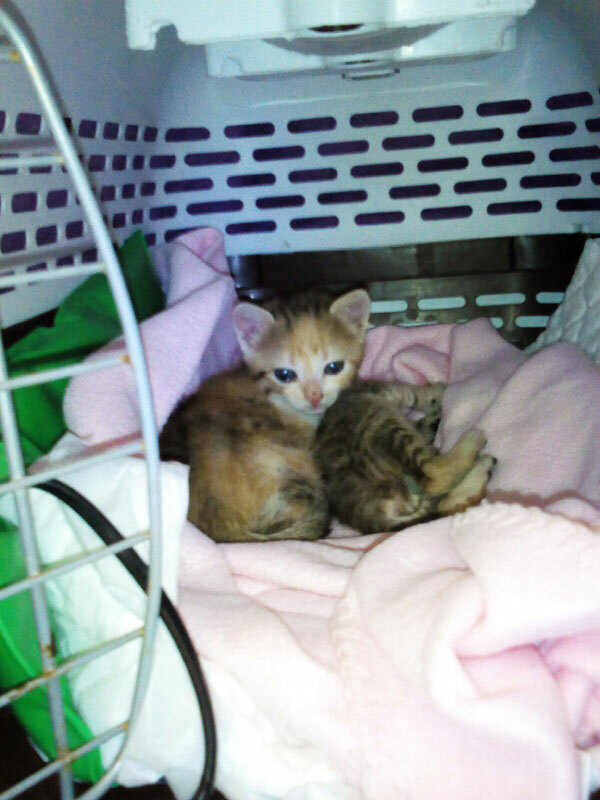 Manolis sent a volunteer to take the kittens to the clinic where he works. Sadly, the two sick ones could not be saved. 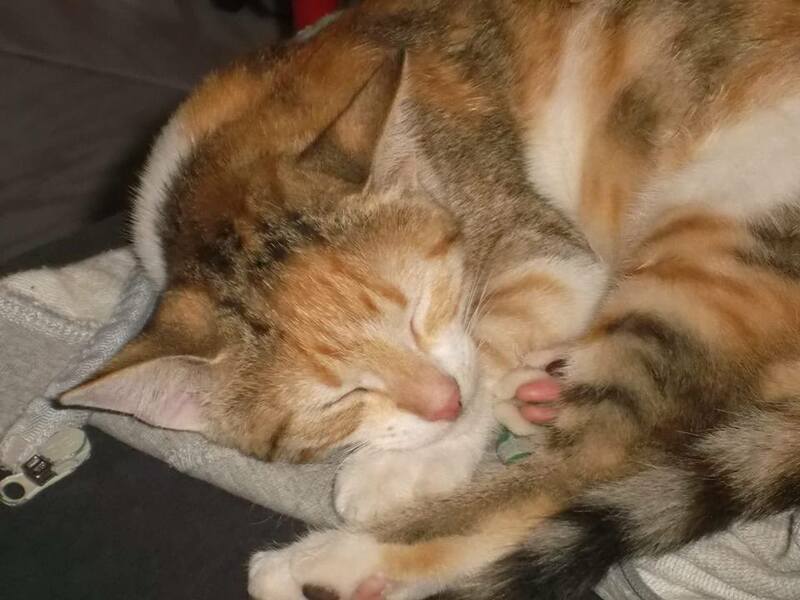 But the third kitten (the tri-color calico), after 2 days of being hospitalized in the clinic, made a full recovery and came back with us to Amorgos. Her name now is Fani. 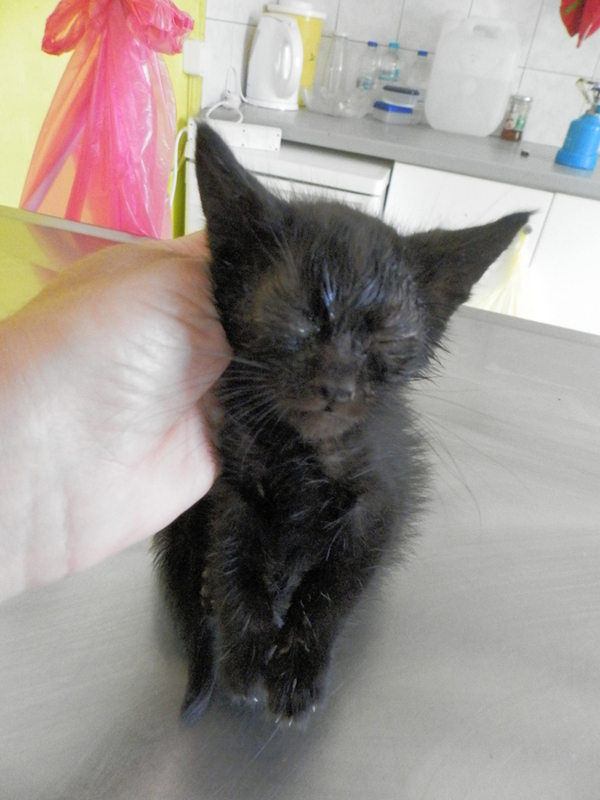 During the same period another kitten was found abandoned on the streets of Amorgos and was brought to our Center. We named her Frinta. The kittens are exactly the same age so they became immediately friends. As you can imagine, they have a lot of energy and they do not stop playing. These two adorable kittens are available for adoption—please contact us at azi.amorgos@gmail.com if you are interested. They will thrive in a loving home! The schoolchildren of the Primary School of Katapola found a small sparrow that could not yet fly and realized it needed some help. They went to their teachers and let them know. We were called in to attend to the bird. While there we took the opportunity to say a few words to the students about how one cares for such a small bird. We returned to our Center with the bird to look after it, promising the students that we will keep them informed of the health of the little sparrow, with hopes that it would eventually be released. A GREAT BRAVO to the teachers and one BIGGEST BRAVO to the students. Today's lesson came to all of us from them. In May of 2017, little Zizi was abandoned, together with her brothers, outside of the primary school of Potamos in Aegiali. After a difficult struggle her small brothers were not able to survive but little Zizi showed a gift for life that helped her to grow strong in her time at our Center. Now, Zizi has been adopted by a local family in Langada, Aeliali where she shares the love and care of a family with two young boys who clearly adore her. We are thankful for another happy ending for another young member of the animal kingdom. 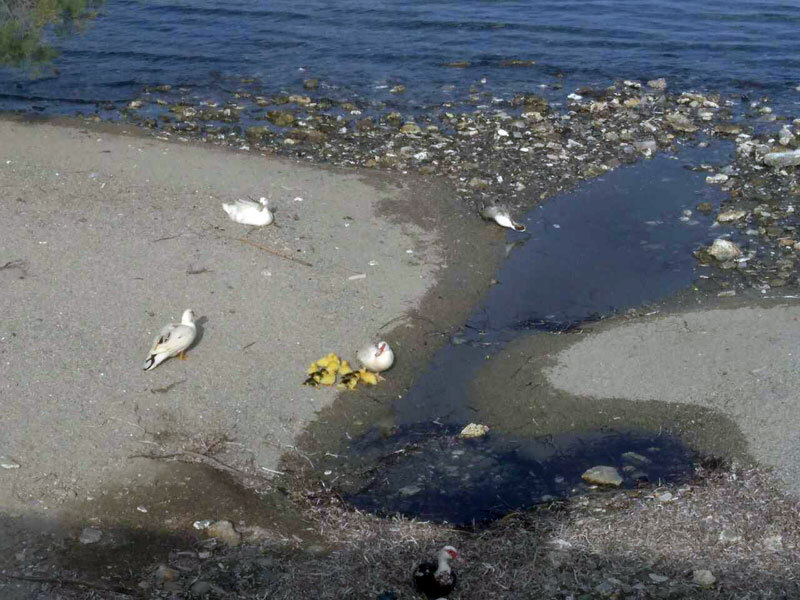 The colony of ducks in Amorgos continue to reproduce during the cold of our winters, and, today, six small ducklings were discovered huddled together against the strong winds that beat against our island. 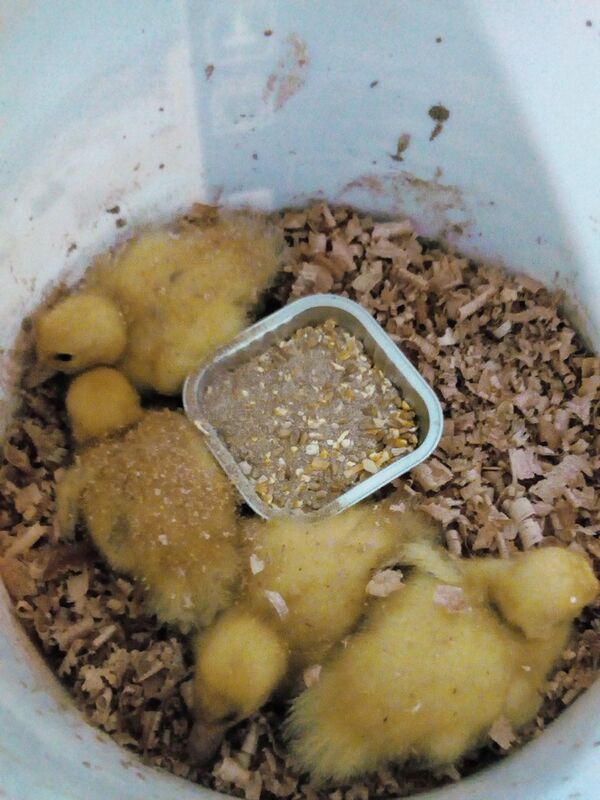 Unfortunately these ducklings were in very bad shape by the time that we found them and we were only able to save four of the six Those four are now with us in our Center and are enjoying the warmth of our glowing stove while they grow stronger day by day. On September 10 2017, a sea turtle of the protected species Caretta caretta (loggerhead sea turtle) was found in distress at the port of Aegiali in Amorgos. Dimitris Synodinos, the owner of the Amorgos Diving Center (https://www.facebook.com/amorgos.diving), along with his diving team, found the turtle looking exhausted and realized something was very wrong with the small creature. 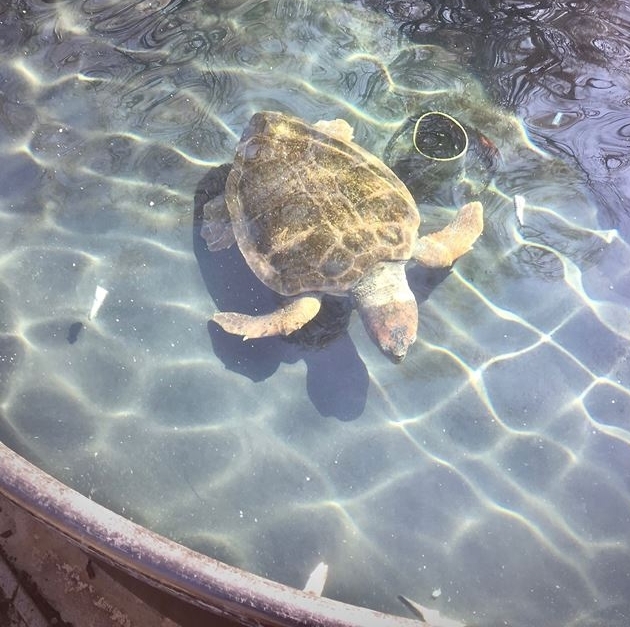 The team immediately contacted the Association for the Protection of the Sea Turtle (Archelon Association) in Athens and were told that it would be necessary to transport the turtle to their facilities so that examination and treatment could begin. Dimitris then spoke with the port authority of Amorgos who contacted our association, and a kind of human chain was created when we arranged for the boat, Highspeed 4 of Hellenic Seaways, to speed the turtle to the volunteers of Archelon that very same evening. Both the port policemen in Amorgos and the crew of the Highspeed 4 did a tremendous job in bringing the turtle to safety. We would like to thank Dimitris Synodinos and the team of the Amorgos Diving Center as well as the port policemen of Amorgos and the entire crew of Highspeed 4 of Hellenic Seaways along with the team at Archelon. According to Archelon, every year about 300 dead or injured turtles are reported through the National Rescue Network. Most of them have been hit by fishermen who have found them in their nets or longlines and who unfortunately do not realize the consequences that this will have for marine life and fishing. 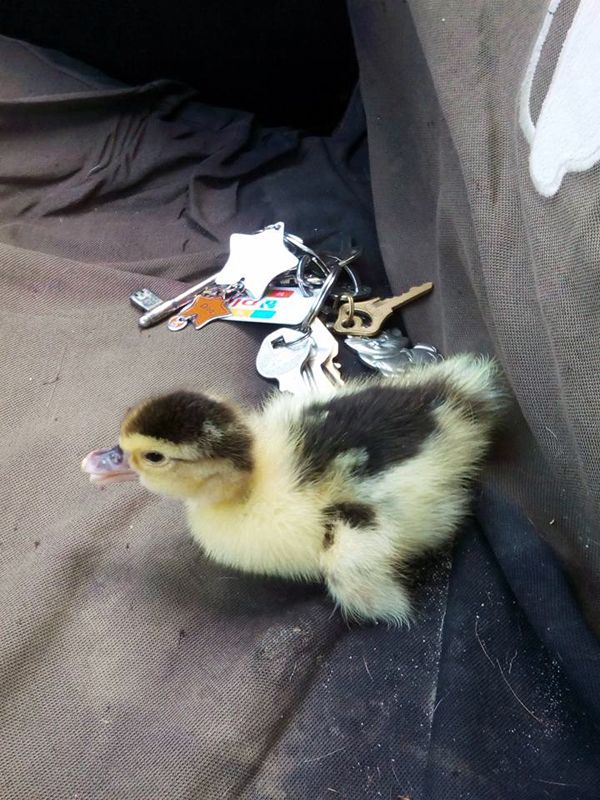 At nine o’clock on Saturday morning my mobile phone rang and I was told of a newborn duckling in trouble on the beach. Immediately I found the duckling and began a search for the rest of her family but to no avail. 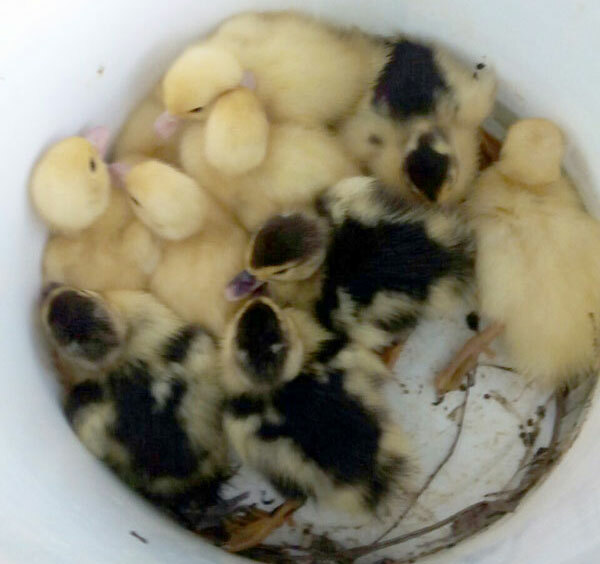 I brought the duckling back to our center to nest with the twenty-seven ducklings that we are already caring for and the baby ate well, drank water and recovered her strength quickly. Later that day I received a call saying that a mother duck with nine ducklings had been spotted on the same spot where our lone duckling had been found. It seemed best to bring the family back to our center. We now have a total of thirty-seven ducklings in our garden and we know that there will surely be more because there are so many cats that roam our beaches, as well as so many seagulls that swoop down on the tiny newborns. Over the years the ducks of Amorgos beach have been fed by locals and the adults do well but the babies are easy prey for predators. This is why we bring them back our garden, where they are safe and fed and given water until they are large enough to protect themselves. At that point we release them back into the colony. We need your support and we ask for your donation. Even one euro is valuable to us and to the animals in our care. We are grateful to have so many online friends! Thank you for joining us to care for the animals of the island of Amorgos. Little Zizi, only three weeks old, came to our Center one week ago and, after receiving intensive care, she has begun to eat by herself. She has now transformed into a playful and active kitten. Yesterday Zizi’s brother was brought to us in serious condition and Zizi has turned out to be the best of nurses. She stays with her brother and licks him and comforts him, and her miraculous care has brought him to the point that we believe this little boy will survive. The family who had adopted him is looking forward to having him back home and they are seriously thinking of bringing young Zizi along with him. We certainly hope Zizi and her brother can be placed together. On Saturday March 25th, a bird of the species Botaurus Stellaris was found lying on the ground by a tender-hearted firefighter who brought the wounded bird to us at our center. We sent the bird to the Alkioni Wild Bird Rescue Center in Paros--https://www.facebook.com/Αλκυόνη-Aegean-Wildlife-Hospital-282833361820028/?ref=page_internal—where it is receiving intensive care. Hopefully there are no broken bones and the bird will recover, but, of course, we know there might be complications and we hope for the best. We want to thank Alkioni in Paros for their excellent work and cooperation with our project. They have helped hundreds of birds from Amorgos to recover from injuries and illnesses. Little Voulitsa was living with her mother, Voula, and her three siblings in an area where there had been serious outbreaks of disease and infection. Her mother Voula was released back into her home area after having been spayed but we felt that we could not allow Voulitsa to return with her mother since the area is extremely dangerous for young kittens. Voulitsa is now six months old and she remains at our Center but she is available for adoption. If a home cannot be found for her, in spring when the weather is warmer, then Voulitsa will have to go back to her area. We ask you to open your heart and home for Voulitsa. The life of a stray is a very hard life. Voulitsa needs a true home. She is now a healthy and active and playful kitten who loves to be hugged. What a gem! Her microchip number is 941000016719360 and below, you will find photographs of the beautiful girl she has grown into. Plume was born in the same building in which our Center is located and for ten years he had a loving family and a best friend in his very own mother. Unfortunately, due to the crisis in Greece, his owner, Francoise, could no longer find work and was forced to move back to her home in Switzerland. For Plume, this was the beginning of a series of tragedies that would change his world forever. When Francoise left, his own mother died suddenly and Plume was left alone. We, at AZI's center, agreed to care for him. But the peaceful and quiet life that Plume had known did not prepare him for a place filled with so many cats that were in our care. Plume decided that he was happier spending more time outside in the neighborhood but it soon became apparent that he had developed an infection. Our veterinarian treated him for respiratory disease and gave him antibiotics but when nothing seemed to help we decided to send him to Athens for a second opinion. The discovery of a nasal fistula began a series of three surgeries and five difficult treatments over a long period of time, all of which left Plume in need of a calm sanctuary. Nathalie, the wonderful woman from Buddy Kat, fell in love with Plume and agreed to take him into their section for cats living with FIV. First though, he would have to be examined by a veterinarian and treated again for the fistula and so Juliette escorted him from Amorgos to Holland where he stayed with her for two days before being fostered by Nathalie at the Villa Vagebond, http://villa.vagebond.com. Plume remains at Nathalie's care at the Villa Vagebond as Nathalie fell in love with him. After going through a series of treatments, finally Plume seems to have overcome the problem with fistula. Plume, in spite of all his problems, is still such a gentle and sweet cat that we hope, despite the fact that he is eleven years old, his time of suffering will soon end. We wish for him a loving home to live out the rest of his days. So many people have become fond of Plume along the way, and we have all done our very best to help him not only survive but thrive. We wish him well on his journey forward. We hope for our dear Plume an old age of peace and loving understanding. On the occasion of this day, we paid a visit to Kalotaritissa where we had learned of kittens who were in a seriously dangerous condition. For many years we have heard stories about the dire conditions of the large family of cats and kittens who live in the Monastery of Chozoviotisa in Chora.